Instagram is one of those things that we either love or hate yet as wedding professionals and business owners we all need to be using it. I've seen so many people struggle with Instagram and how to best use it for their business. Yes Instagram can be difficult to master and yes it can be a pain in the arse but hopefully a few of my below tips will help make it a little more straight forward for you. 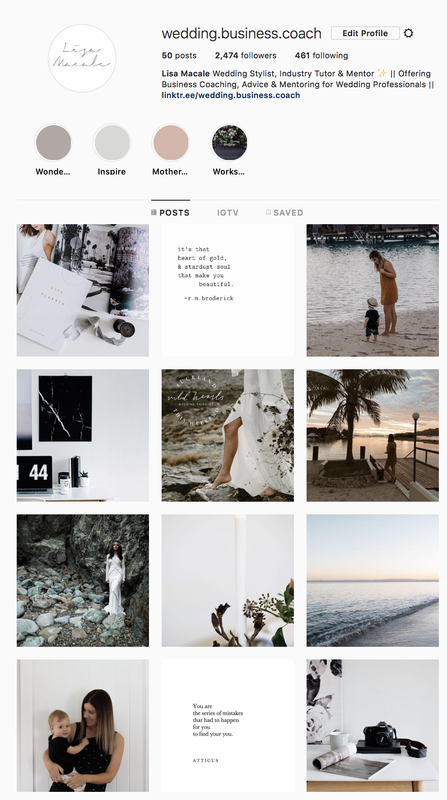 I could write about this topic for weeks and weeks and still don't think I'd cover everything so for this post I've included specific ideas for planning your Instagram feed. After working with some wonderful wedding professionals in the industry I've learnt a few things along the way to make Instagram planning run a lot more seamlessly. I find it helps to plan out a month at a time so that your feed is consistent and so you don't have to keep coming up with new ideas every single week. 1. Work out how many images you hope to post in a month. I find one a day is a great place to start and wont annoy your audience by inundating their feeds with images. 2. Work out what your brand message is. For example if you're a wedding planning and want to be offering advice and tips to potential brides you might like to consider mixing up your feed with quotes, tips, graphics etc. 3. Start with a plan for 1 week first which can then be duplicated across 4 weeks to give you enough content to carry you through for the next month. This will be your content plan. Consider the types of images you want to post e.g. Images of your weddings, sneak peeks, videos, quotes, testimonials, inspiration, giveaways, tips and tricks. 4. Use a program like Canva to create any graphics or images with text that you want to include. 5. When selecting the images you want to use make sure they all work in together. They all should have a similar colour palette (that matches your brand colours) and there should be a consistent theme/style to your images. Ideally you wont your feed to show who you are, what you do and what your business is all about. 6. Use an app like 'Planoly' or 'Later' to upload all your future images. From there you can move around your images to work out the best format. 7. Don't use two similar images side by side. For example if you are using an image of a flat lay make sure the next image has the subject shot as a distance (unless of course you're whole brand is about one particular type of image). 8. Create an Instagram routine. For example you might find your posts get most engagement between 8-9am. Make this the 1 hour a day you spend on Instagram uploading your daily post and connecting with your audience. You shouldn't need to be spending more than 1 hour a day on Instagram if you strategise your time effectively. 9. Research the best hashtags for your business and have them saved in your 'notes' ready to copy and paste in your image captions. Just make sure you mix up the hashtags slightly so they relate to the type of image you've posted. 10. Rather than sharing groups of images on your feed, use your Instagram stories to tell the rest of the 'story' behind the image you've posted. Make sure you are monitoring your analytics on a regular basis and also changing your content to reflect what is getting the most engagement. I hope this is helpful. I will write a Part 2 on this topic in the coming weeks. Everyone does it, we live in a world of people 'faking it' in business. Consider social media for a second, we see thousands of wannabe bloggers and influencers with their online picture perfect life. A few things I've learnt in a world of start up entrepreneurs is that to some degree everyone is 'faking it' in the initial stages of starting a business. Don't ever feel disheartened by what you see online and remember always that its all about perception. A way I often see people 'faking it' is through the terminology they use in their business. Yes of course we all want our clients to think of us as successful and often we want our businesses to appear far bigger and better than what they actually are (especially when we are just starting out). One thing I frequently hear is reference to certain things I know many fellow wedding planners don't actually have such as a studio, warehouse or office space. Nearly every stylist/planner I know in my local area doesn't have any of these things. Warehouse is often code for their home garage, office is code for their spare room and studio is most likely also referring to their garage or spare room. So don't ever feel that you need any of these things. Unless of course you are running a hire business and need warehouse space, there is absolutely nothing wrong with having a home based office. Its far more cost effective, accessible and easy to manage. Another thing I hear often is reference being made to things like - my team, my staff, my head stylist, my assistant etc. For nearly everyone starting out yes they might have a couple casual staff or even one part time staff member but definitely not an entire team or what you would call a workforce. If you really want to 'fake it to you make it' then consider giving yourself a creative job title. I use to have a printed out piece of paper in my office with my name and CEO written next to it. Why couldn't I call myself that? I'm the owner of the business so I can call myself anything I like, right?! I laughed every time I saw this 'CEO' reference. Of course I wasn't a CEO, my business wasn't even set up as a company and I had no full time employees. But hey we see this time and time again. If you give yourself a job description like 'Creative Director' then of course your business size automatically triples in peoples perception. There is nothing to be ashamed of when doing anything of these things. Remember we all need to start somewhere. What I think is important to always consider is your online presence and the perception this is putting out to you target market. Your online presence is ultimately what is going to sell your business and the services you offer (unless of course you have a shop front). It's where you can create any perception you like of your business. So why not create a perfect Instagram feed, have a beautiful and professional website and frequently show BTS videos of that one small space in your 'studio' that looks perfect. Other vendors will know what you're up to but will your client? Most likely not so my advice is just continue to fake it until you make it! Business Tips, Running a Wedding Bus. As a Wedding professional, why should I blog? I know blogging is very time consuming and for most of us (like me) who seem to write with lots of spelling errors its a painful process at times but let me start this off by telling you a funny story about my experience with blogging. Back when I had my styling business I would blog at least twice a week. I consistently did this for 3+ years and there were very few weeks that I missed. I tried to mix up the content as best as I could. One of the topics I often covered was around the struggles of working from home. In one particular post I made reference to my neighbour who also worked from home. She would often wear her dressing gown and slippers right up until the early hours of the afternoon. I made reference to it in one of my blog posts as a recommendation of what not to do! I happened to find myself one day at the bottom of my drive way checking the mail and my neighbour yelled out to me for a chat. The first thing she said to me was "I just discovered your blog over the weekend and I love it, it really made me laugh so much and I have read back through all your posts". In that moment I went bright red I knew straight away she had read the blog post about how I referred to my 'funny neighbour in her old robe and fluffy slippers'. It was only like 3 posts down so I knew she would of seen it. At this point I didn't even know my neighbour knew my business name let alone that I had a blog. And that she actually would want to read it and give me genuine compliments about it. The whole situation was hilarious looking back - gosh I hope she doesn't read this one too. Sorry Sharon! The important thing to take from this is that you don't realise just how many people your blog is reaching and the benefit behind it. Not only does blogging dramatically increase your SEO it also helps you engage with your audience and develop your brand. When I stopped blogging just before I sold my styling business I had 7 people email/message me within 2 weeks asking why I've stopped blogging and how much they loved reading my posts. I had never met or spoken to any of these people before and to be honest most of the time I thought that no one even read my posts. It was very rare that anyone would actually comment on a post so quite often I thought they were going unnoticed - now of course you should be checking your google analytics to see what traction your posts are getting. Blogging is powerful. Not only to engage with your audience but to build up your sites SEO. It also helps you to look more legitimate - people build trust when there is a real person behind a brand. I would love to hear how blogging has been successful for you in your business? Please comment below so I know someone has read this one! haha I'm completely slack with monitoring my own website analytics. I have to admit my first few months of being a Mum was fairly easy for me. My son slept often and I made the most of every 3 hour nap he had. I often thought to myself that I'm nailing this work/mum life balance. I remember a week out of hospital I was up to date with all my work and I had no idea what this whole issue was around being a Mum and also working. Then my son got to around 6-8 months old and EVERYTHING changed. Not only did we go through some terrible sleep regression period, he became extremely active and day sleeps were like 20-30 mins in duration (just enough time to have a shower or eat something). The struggle become very real and I often felt like I wasn't coping or that there was just no way to move forward with my work or business goals. Just before my son was born I decided to start a new business. I thought it was the perfect opportunity as I was finishing up my full time job to work part time from home and I would have so much more time on my hands.... When I was pregnant I was working both a 40 hour a week corporate job and from home 20 + hours a week so I'm sure you can understand why I thought my life was going to become easier. Oh how I was wrong. This past 12+ months has really taught me so much about time management and valuing my time. One main thing I've learnt is that 'Mum Guilt' is a very real thing. We beat ourselves up about absolutely everything, no decision is every the right one and we second guess everything! I really wanted to be home with my son for at least the first 12 months of his life so I put off sending him to daycare for as long as I possible caught. By the time he was 8 months old I was drowning in work and felt like I was going crazy. I felt like I didn't have a choice but to work every weekend to stay on top of everything. By the time he was 11 months I decided it was time to send him to daycare (despite the feedback from family members that he was far too young). I knew I needed it for my own sanity. Even though I felt extremely guilty about it my son absolutely loves it and I know its the best thing for him. I value my days even more when its just the two of us and my work days (when he is at daycare) are now so extremely productivity. I don't even stop to do washing or dishes (much to my husbands annoyance! haha). Understand your why. If you don't have a clear purpose for what it is you are doing then trust me your motivation will slide and within time you are going to resent whatever it is you are working on. Don't feel guilty for having days where you just do nothing but be a Mum. You can't do it all and some times you just need a day to not think about work and recharge. Some days are going to be complete failures, just accept it and move on. I have the best of intentions some days to work through a huge to do list and priortise my work, then for what ever reason I wake up in the morning with zero motivation to do anything but sit on the couch listening to the wiggles with my son (its true this happens often! haha). When you've had a night with a teething baby and very little sleep your heads just not going to be in the right space to work so its best to just accept there are often going to be days like this. Structure your days. Children love structure and routine. Your business/work will thrive with structure too! I know every day that my son is home that he will sleep for roughly 1-2 hours some time around mid day. I don't use this time to do house work or anything else unnecessary. The second his head his the sheets I'm in my office working through a very well prioritised to do list. I know I can do washing, dishes etc when he is awake but sitting at my computer for any more than 2 minutes while I'm looking after him is completely unrealistic. You really need to make the most of your time and have a very well thought out schedule. Always have goals to work towards. To get through the day to day boring tasks you need to be working towards something. There needs to be clear objectives set for what you are doing and trying to achieve. Book a holiday. Ok I know this isn't possible for everyone but seriously the only way I get through my day to day work is knowing that in a few months time I'll get a much needed holiday. It keeps me sane and it's really the light at the end of the tunnel for me. I love having something to look forward to! As entrepreneurs, wedding planners and stylists starting out its common practice to work from home which if you are anything like me it brings a wide range of challenges that you never anticipated. Some days just getting changed in the morning can seem like to much effort! This is something I have struggled with on and off for the past 5 years. Some days I absolutely love the freedom of working from home and other times I find it unmotivating and just plain boring. I so miss working with likeminded colleagues and being able to access delicious coffee at any moment of the day (my Nespresso machine just doesn't cut it!). Go grab yourself a coffee first thing in the morning. If you are anything like me you know that if you worked in an office environment you would be getting a coffee to start off your day so why should it be any different at home. Yes I know its a bit expensive to do this every day but for me it is an absolute necessity. I also ask for my coffee extra hot so it stays warm for at least the first hour that I'm at home - you can thank me later for that tip. Don't ever work in your PJ's. Its just not a good look and will make you feel like you need to get back into bed all day. You may even end up on the couch asleep so my advice is just don't do it. PJ's are for bed not work. Get out of your activewear. I know getting dressed in corporate clothes when you're at home is completely ridiculous but trust me getting changed and doing your hair/makeup will make you motivated for the day. It will also make you feel a bit more comfortable going out to grab coffee first thing in the morning. Don't have any 'home' stuff in your office space. This is so important! Keep your office space completely free for work. Whether this is you spare room, study nook or area of your lounge make sure it is completely free of any clutter and anything that doesn't relate to your work. For example don't keep your home bills or personal to do list anywhere near your desk - it will constantly distract you. Schedule every hour of your day. If you need to get some home stuff done during the day such as washing, dishes, shopping etc then schedule this into your day. Ideally do this at the beginning or end of your work day so that you are not stopping work and getting distracted. I have every hour of my day scheduled to a particular task - it helps keep me accountable and motivated. Get yourself an office pet. Ok so this isn't essential but gosh having a dog or cat keeping me company makes me happy throughout the day. Even if my cat constantly meows as least she likes listening to my ideas. Attend regular industry events/workshops/seminars etc. Working from home is incredibly isolating and often quite boring. Definitely break up your work weeks with networking and socialising with other working from home people in your industry. Chat to friends who work from home throughout the day. I have a few friends that I talk to nearly every day who also work from home. Its amazing how helpful they have been to have ideas to bounce off. Is there anything else you have found helpful? Please leave it in the comments below, I'd love to hear anyones suggestions. Break down everything that is included in your pricing. For example if you are offering a wedding coordination service for say $2000 which requires you to be at the wedding for 10 hours on the day, a bride is automatically going to think she is paying you $200 an hour which to her may seem ridiculous. Here is what she is missing - all the time that you are going to spend working on her wedding beforehand and all the costs you have for actually running a business. What this $2000 doesn't show is the 20 hours+ you will spend calling all her vendors, putting together a detailed timeline and the consultations you will need to have on site beforehand. Then of course there is your expenses for actually running a business - insurance, accounting, admin, marketing - the list goes on. I find it always pays to show your bride in writing exactly what your service will entail. List everything out in detail! Include hours if you need to, for example if you will spend 3 hours on the timeline, 5 hours at consultations, 5 hours for contacting and confirming vendor details etc outline this all in your quote. Make it clear to your client that there is far more that goes into the wedding than just what happens on the day. If you need to reassure your bride that you are a professional and not just a random wannabe wedding planning working from your spare room then drop in a few comments about previous weddings you've done, the vendors you know personally that would suit her wedding and that you have a dedicated experienced team of staff. Remember always, your time is valuable. In the corporate world you would never come across a company working on a project for free. Think about this is you went to an accountant and asked if they were willing to negoiate on their fee do you think they would? Or what if you asked them to put in a few extra hours for free? Of course they wouldn't so why should we as planners or stylists work any differently. Our prices are what they are because that is the genuine cost of being in business and making a profit (it's not like we a millionaires, most profits are fairly minimal). If you don't value your time then you will never get ahead and grow your business. Every single minute that you spend working on a clients wedding needs to be accounted for. If you need to take records of the hours you spend on a clients wedding and put it into your invoices then do it. Did you know accountants charge out their time in 6 minute increments? I would encourage you to keep a record of the time you spend on each wedding day. That way moving foward you can make sure that your pricing is a true reflection on the time you put into each wedding. Don't compare yourself to your competitors. There is always going to be other businesses starting out in the industry offering the same services you do for next to nothing. There are a few key things to point out here. Nearly always they crash and burn within the first year of business or secondly they start to hate what they do because they know they are not making any profit (sometimes it might actually be costing them to keep their business running). I know brides compare businesses on price and no matter how much you sell yourself and your expertise a bride will always have price at the back of their mind. To overcome this you need to compare your service to what your competitors are offering - take price out of it and look at exactly what these other vendors are offering for their next to nothing pricing. Are they going to have the skills you have to put together an 8 page extremely comprehensive detailed timeline? Are they going to put together 3D floor plans and an impressive styling proposal? Most likely no they wont because they simply don't have the skills or expertise. Show your couple an example of your work and make them understand that you are serious about what you do and that you have the knowledge and skills to execute the most amazing wedding that is going to wow everyone attending. Be upfront with your pricing. There is always going to be time wasters and budget brides. If this isn't your target market then try and avoid having these people even submit an enquiry in the first place. When I first started out I was getting so many enquiries but only about 15-20% actually fitted in with my target market. The rest wanted a styled wedding far cheaper than what I could do it for. I did a couple of things to get rid of these time wasters. Firstly I put my starting from pricing on my website, secondly every single new enquiry I received I responded with a services brochure which further outlined my pricing in more detail. I hope this is helpful, if you have any further questions please do feel free to leave them below. There is so much more I could write on this topic! I understand the concept of hiring a wedding coach is a new term for a lot of people just starting out so I thought I would answer a few questions for you all to better understand how this all works. Why should I hire a wedding business coach/mentor? A coach will give you honest, constructive feedback on a particular area of your business you are needing help with. You'll receive advice specifically tailored to your business from someone who understands exactly what you are going through and the challenges you are facing. Working with a coach should ultimately help you to get your business of the ground or take it to the next level. When you work with me I will give you realistic goals to go away and work on. I will also help keep you accountable. Who needs a business coach/mentor? In my opinion everyone starting out with a new business or in a new industry needs a business coach! I wish I could go back in time and hire a business coach myself in the first year I started my business. My husband become my go to person for advice, support, guidance and feedback. The only (very large) issue is that he had never owned a business and he certainly had no knowledge of the wedding industry. Working with someone who can be your support, understand your business, the industry you work in, give you real life examples, valuable and honest feedback while keeping you accountable - in my opinion is one of the best investments you can make when starting a business. What types of businesses can you help with? My background is working as a Wedding Planner and Stylist but I'm more than happy to help any professionals starting out in the Wedding industry. Whether you make wedding stationery, cakes or do floral design what I have learnt in business will very much apply to your business. What makes you different to other coaches? I have not only worked in the industry, built up my own profitable business but I also teach students on a daily basis through my job at the International Wedding Academy. I have worked with a variety of students as they start their journey towards launching their own business. If you have any other questions please do feel free to leave them below or send me a message directly. I have been very fortunate over the past to have all my styled shoots featured in various magazines and blogs including Modern Wedding, The Lane, Hello May and White Magazine. During this process of getting work featured I have learnt so much and I hope some of the below tips might help others looking at the best ways to get their work featured online or in print. 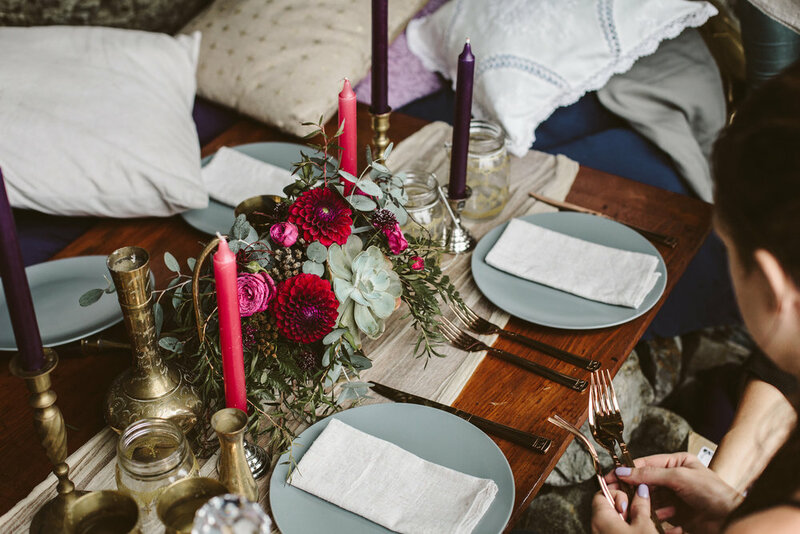 Firstly if you are planning a styled shoot you need to make sure it is very well planned. Consider doing something a little unique but with on trend details. I would also suggest getting lots of vendors on board – the more vendors you have the most exposure your shoot will gain. Make sure to research the type of shoots/weddings that the magazines and blogs you plan to target typically feature. For example does your favourite wedding magazine feature more on trend modern shoots or do they have a different look to their magazine. Think about the types of shoots they feature and then make sure the style of the shoot you are planning matches up with this. Next you need to do some research into the submission guidelines for the magazine or blog you plan to target. You will often find submission guidelines on their website. Submission guidelines will cover things like the types of photos they look for, file sizes required, quantity of images you will need to submit etc. Here is a little tip – if you use vendors in your shoot that advertise with the particular magazine or blog you are targeting then it is far more likely you will have your work featured. Magazines especially really favour their advertisers. When you have submitted a styled shoot or wedding to one of the magazines/blogs it can often take 2-3 months to hear back if they will feature your work. In the mean time you need to make sure not to post the photos anywhere else. All of the blogs/magazines will want to feature the images exclusively and it wont be until after they have featured the shoot that you can then start to use the images elsewhere. It can be a very long process from when your images are sent off to when they are actually featured. Sometimes you can expect to wait 6-9 months until they actually appear in print or online. Don’t be disheartened if the magazine/blog you approach first doesn’t want to use the images, there could be various reasons for this so make sure to have a plan B for where you can send the images. Here’s where all the physical work starts. After months (sometimes even years) of planning and organising it’s time to bring the design to life. On the days leading up to a wedding, you will find me driving around town in my van picking up hire items, furniture, flowers, stationery and everything else needed to make the wedding come together. The prep is so important and I will often have to strategically plan how I’m going to pack everything correctly into my van to ensure no breakages or squashed flowers (that’s a disaster I try to avoid). There’s also a lot of cleaning, packaging, bubble wrapping and sorting out of hire items. I have become a professional van packer and now ratchet straps are a common thing I’ll cart around with me. Ok so hopefully by Friday I’ve collected everything for the wedding and I will spend the day making final plans which often involves repacking my van and preparing all the floral arrangements. Fridays can be a little stressful at times. I go through all my run sheets, make final calls to the vendors and check that the bride and groom are all relaxed (well as much as they can be) and prepared for the day. These is when the magic happens! My team are normally on the road extremely early in the morning with a full van and bucket loads of flowers! The set up can typically take most of the day and we like to ensure we have ample time in case there are any unexpected issues that arise. Let’s just say it’s an incredibly physical job. Unpacking vans and moving around furniture and heavy items especially in the Brisbane heat can be extremely exhausting! I once asked a friend of mine to help me with some heavy lifting for a wedding and he was absolutely shocked how physical and time-consuming wedding set ups are. You have to be prepared to sweat, get a few bruises here and there and use a bit of muscle! My favourite part of putting together a wedding is stepping back from it once everything is completed. It makes me realise why I do this for a job and why I love it so much. The finished product makes all the hard work worth it. Then…. its back to the venue at midnight for a pack up which can typically take a few hours (we have now gone from the best part of being a stylist to the worst). Just imagine this …. you have literally just worked a 12 hour day got home for a short rest and now your back at midnight to pack down the whole thing. This is when I often resort to McDonald’s, more coffee and Red Bull drinks (I’m not proud of it). By this stage, I most likely have blisters on my feet and feel like a walking zombie. And just when you thought it was all over the clean up beings! Again not the most fun part but it has to be done and often the pack-down/clean up after is far more time consuming than the prep that goes into the wedding. Everything has to be cleaned, packaged and stored away. We will also have to spend Monday/Tuesday delivering hired items and stock back to local businesses. The worst job – cleaning wax out of candle holders which can take a whole day! I hope that might give some of you a little insight into what goes on behind the scenes. It’s definitely not the glamorous industry that some would associate wedding styling with but if you are truly passionate about weddings and bringing together a perfectly planned and beautifully executed event all the hard work is worth it. It has just come to my intention this morning that the very popular and long standing wedding blog Style Me Pretty is coming to an end. As one of the first ever blogs I followed and also where I had my own wedding featured (back in 2012! ), it was sad to hear this news. I know the reality of having a successful blog in 2018 is no doubt a challenge and turning that success into profit is even more of a difficult process. After seeing many other popular blogs and even publications (like the Collective!) follow suit, its definitely tuff out there and investors aren't willing to spend the money and support these platforms. Even the most perfect of weddings must eventually come to a close. The same is true for us here at Style Me Pretty. 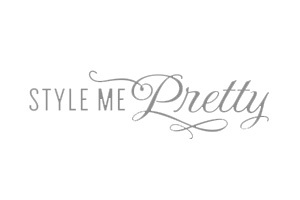 After an incredible twelve years of sharing your beautiful weddings, we will close Style Me Pretty on April 30th. While we won’t be posting any new stories after today, you’ll be able to view and save anything on the site up until the end of the month. We’re so proud to have played even a small role in sending so many brides and grooms off into their happily-ever-after. Thank you for sharing such special moments with us.